This post is sponsored by Åhléns and as always, photos and words by me. A while ago I was asked by Åhléns (Swedish department store chain) to share a recipe on the theme “Alla länders land”, meaning “The country of all countries”. If you’ve ever been to Sweden (or Scandinavia) you know that we hold our herring, smoked salmon and new potatoes very dear. And those are the things that you would always find on a Swedish summer table. With the campaign Åhléns wants to inspire to add new dishes, and with influences from other countries, to the table this summer. My head immediately started spinning with ideas, since summer is my favorite season to cook. 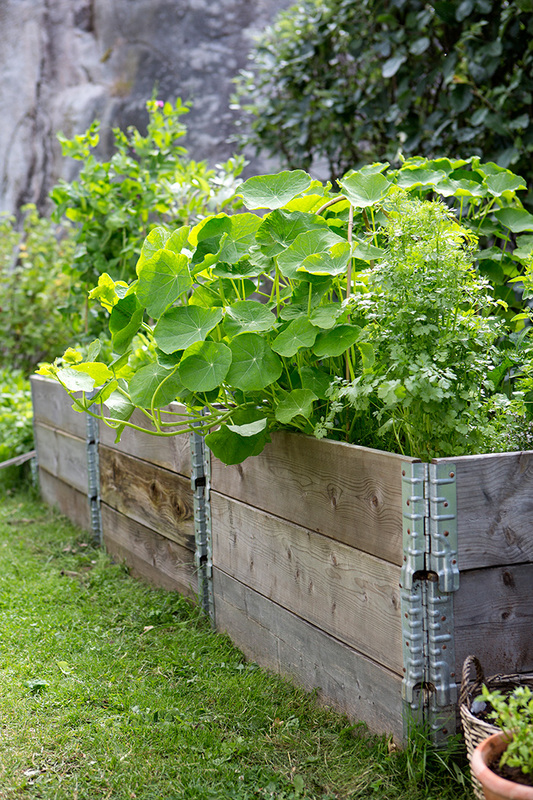 Greens and fruits are abundant, and the limits on what to cook seem to be endless. Having said that, I don’t like to spend a large amount of time cooking in the summer, but rather spend more time to chat with family and friends around the table. I also like to use as much locally grown produce as possible, which is perfect because it doesn’t need much time or effort in the kitchen. The recipe I’d like to share is one that I made often last summer, and will for sure make again this summer. 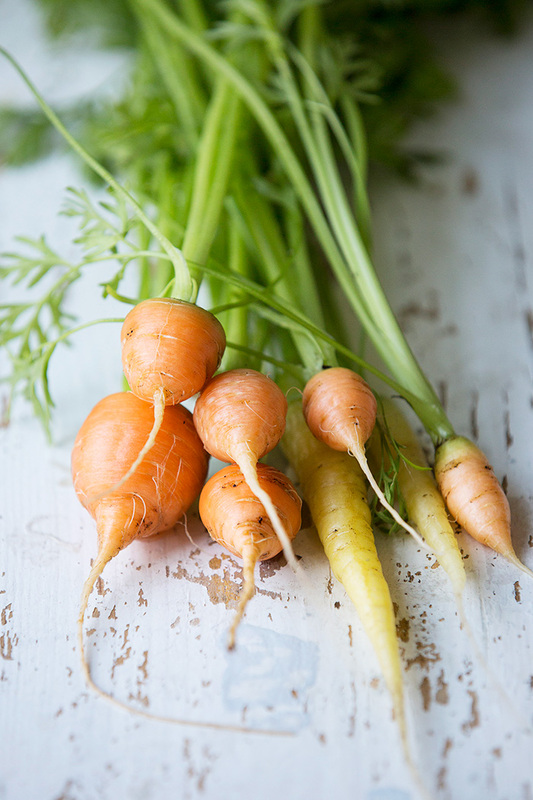 In our garden, I grew the prettiest, most delicious, little carrots named “Paris Market”. Cooked them quickly and paired with Turkish yoghurt, dill and toasted cumin seeds. Fresh, locally sourced and fast – just the way I like it! In traditional Swedish summer coking, crème fraîche or “gräddfil” (similar to butter milk or crème fraîche, but with less fat) is commonly used. 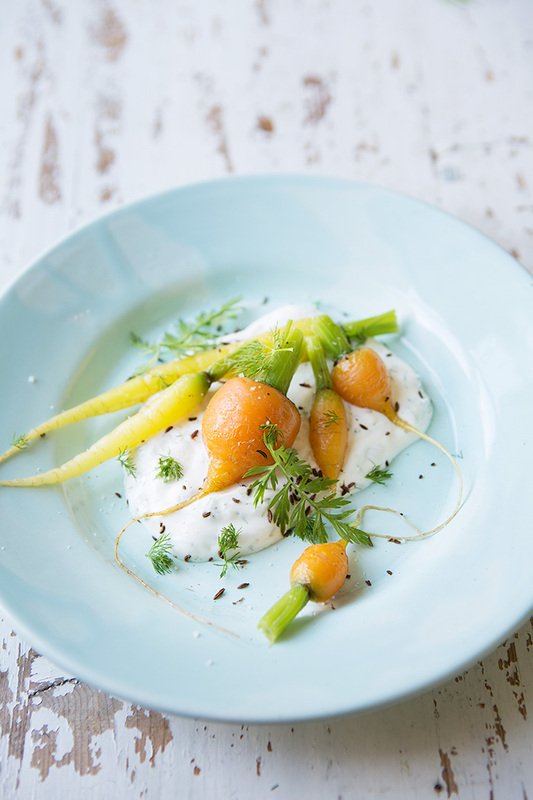 But I like Turkish style strained yoghurt better, both for its thick creamy texture, the slight acidity and how it elevates the sweet carrots. Cumin has been commonly used and cultivated in Sweden for several hundreds of years, and it is also frequently used in Mediterranean and Middle Eastern cooking. Cumin is actually also related to carrots, which makes it the perfect match for this dish. A marriage between classic Swedish and East Mediterranean flavors. I hope you’ll add this to your repertoire this summer. Great as a snack before dinner, or as part of a “smörgåsbord”. Enjoy! And please share in the comments your own suggestion for a new dish to add to the “smörgåsbord” this year! 1) To make the dill yoghurt, mix the yogurt with olive oil, dill and salt and place in a serving dish. Put the dish in the fridge while preparing the carrots. 2) Heat a small skillet or frying pan over high heat and add the cumin seeds. Shake the pan to keep the cumin seeds moving and toast until the seeds darken slightly and smell fragrant, about 1 minute. Set aside. 3) Brush the carrots clean under running water and put them in a medium pan with water and butter. Bring to a boil, cover with a tightly fitting lid, and let them cook at moderate pace for 5-6 minutes. Remove the lid and check for tenderness. The carrots should be tender but with a little bite. Drain and serve with dill yoghurt and toasted cumin seeds. hope you are doing fine! I also wanted to cook a dish with young carrots this weekend but the farmers woman told me that they are not ready yet. so I have to wait another week or so. I imagine a recipe with crumbled parmesan cheese and maybe also with a joghurt with cumin (bit in it…). let’s see!